A pre-emptive funeral for another piece of Nintendo innovation. If I had to describe Nintendo in just three words, I'd steal the shared city slogan of Austin, Santa Cruz and Portland: "Keep Nintendo Weird." The Japanese game giant delights in its unique character and has made a habit of defying convention. Nintendo's gimmicks are always fascinating, but they don't usually work out. The Wii Remote's speakers largely went unused. Most third-party developers failed to take advantage of the Wii U touchscreen. So what's Nintendo Switch's soon-to-be-overlooked innovation? A haptic feedback system called HD Rumble. 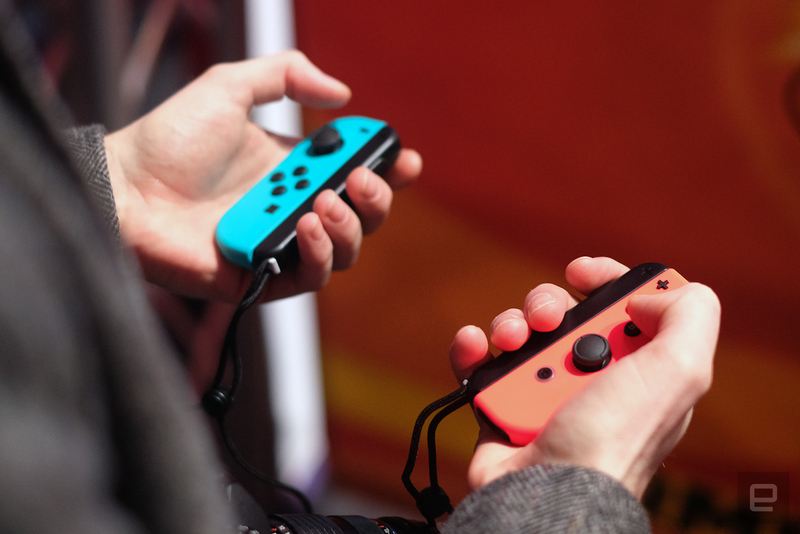 Nintendo's Yoshiaki Koizumi introduced the feature at the company's launch event last night by picking up a Switch Joy-con controller, and moving it lightly. "It feels like something shaking in a glass," he said. An animated cup appeared on screen to illustrate his point. Koizumi explained that HD Rumble's subtle feedback allowed him to feel more ice cubes dropping into the virtual glass. As the on-screen cup filled with water, Koizumi said he could feel the liquid rising. This is Nintendo's new gimmick: being able to feel specific sensations through the Switch's controller. It's an evolution on the blunt vibration of modern force-feedback engines, and it oozes potential. Nintendo believes in this feature enough to have built an entire game around it. The new console's showcase title is 1-2-Switch. Like Wii Sports and Nintendo Land, it's designed to sell players and developers alike on the Switch's new features. The twist here is that for most of the minigame compilation's modes, you're not supposed to look at the TV screen -- you're supposed to feel the game through HD Rumble. This means adjusting how you pull down on a digital udder in a cow-milking game based on resistance or knowing when to open a safe based on how the lock's internal tumblers feel in your hand. It's conducive to experiences that feel more like engaging in make-believe with the other players than playing a video game. It's too bad that probably no developer apart from Nintendo itself will ever use this feature. It's a story as old as the original Wii: Nintendo tries to disrupt the game industry with a new innovation only to watch third parties do the bare minimum to support those innovations. The Wii Remote may have been a motion controller, but most games used its waggles to merely replace a button-press. The Wii U gamepad offered the potential to create transformative dual-screen gameplay, but we were lucky if third-party developers merely mirrored their titles' TV output on the bulky tablet. When was the last time you saw a 3DS game use the portable console's augmented-reality features? Probably never. Even the 3DS's flagship feature goes relatively unused these days, with the majority of Pokémon Sun and Moon and Dragon Quest VIII being presented in nonstereoscopic form. It's hard to imagine that a subtle evolution in force-feedback technology will fare any better. On the other hand, HD Rumble has the advantage of being a successor to the one innovation Nintendo did get the rest of the industry to adopt. The N64's Rumble Pack was a mere novelty when it launched with StarFox 64, but today gamers expect their controller to shake with the highs and lows of on-screen action. Third-party developers (and console competitors like Sony and Microsoft) probably won't be scrambling to build screen-optional games like 1-2-Switch, but maybe Nintendo's efforts will push a more nuanced form of force-feedback technology into the norm. Unlikely, perhaps -- but it would be nice to see one of Nintendo's more-bizarre innovations bear fruit at least one more time.